Black holes are famous for their muscle: an intense gravitational pull known to gobble up entire stars and launch streams of matter into space at almost the speed of light. It turns out the reality may not live up to the hype. In a paper published today in the journal Science, University of Florida scientists have discovered these tears in the fabric of the universe have significantly weaker magnetic fields than previously thought. The measurements bring scientists closer to understanding how black holes' magnetism works, deepening our knowledge of how matter behaves under the most extreme conditions—knowledge that could broaden the limits of nuclear fusion power and GPS systems. The measurements also will help scientists solve the half-century-old mystery of how "jets" of particles traveling at nearly the speed of light shoot out of black holes' magnetic fields, while everything else is sucked into their abysses, said study co-author Stephen Eikenberry, a professor of astronomy in UF's College of Liberal Arts and Sciences. The magnetic fields of these non-existent entities will also be non-existent. The measured magnetic field is obviously not non-existent however. The paper, unfortunately, is closed access and there is no arXiv copy. 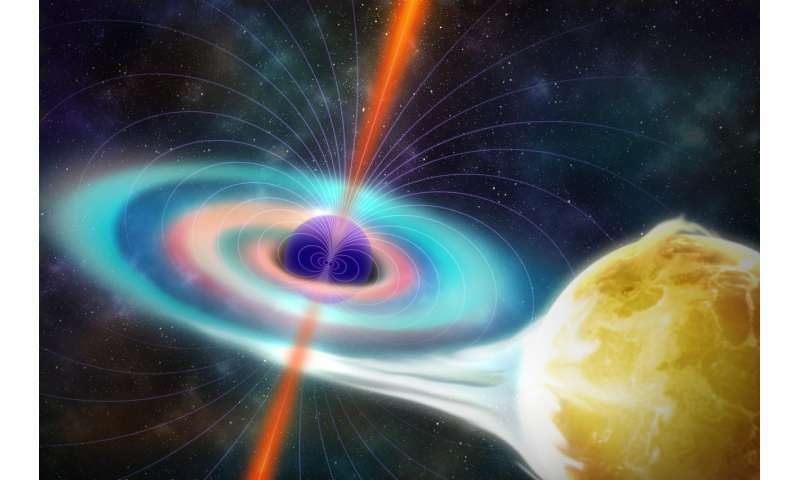 Without a clear understanding of the methods by which they collected the data it's not clear whether they're talking about magnetics from the black hole itself or magnetics from the accretion disk currents. The article here does not make this clear. It's also not clear whether jets were being emitted at the time of the measurement. To add to the uncertainties, conditions could, and almost certainly do, change between times when there is a lot of matter falling into the accretion disk and when it is not. So while this is an interesting result, we need more information to decide what's going on here and to what extent it challenges current models of black hole accretion. I guess we should have expected Don Scott to say that because he's an idiot. Hawking radiation has nothing whatsoever to do with jets. @Da Schneib, if we are to accept that light cannot escape a black hole, then the magnetism cannot be from the black hole itself, given light and magnetism are from the same LIGHT SPEED limited force. I do find it interesting that gravity can escape from black holes. Weird comment I know. Helps to suggest that gravity is curvature of Spacetime and perhaps not a force with a force carrying particle. I (like you Da Schneib) thought a black holes magnetism must originate outside of the event horizon and therefore from an accretion disk and it's rate of rotation. A WILD speculative Sci-Fi idea of mine, is that from time to time, a black hole emits radiation because it sucked something in from SOMEWHERE else. Yup SciFi concept that a black hole is a tunnel to some other place and is perhaps a bi-directional atom shredding "machine". @jimbo, it's not clear to me at all that magnetism can't be produced by a black hole since one of the things a BH can have is electric charge. See Kerr-Newman and Reisser-Nordstrom black holes (Wikipedia discusses these equations and you can follow up to scholarly sources for more detailed information). I make no comment (quite deliberately) on anything that happens inside an event horizon since I don't think we have the physics even to speculate with any serious possibility of being right. This was painful to read. Sooo some gold digging group of people got funding for this study? Then post a paper where they try to seem surprised about the obvious findings? How can you be surprised that a phenomena that light cannot escape from does not have a large detectable magnetic field? (rhetorical) Stop posting stupid studies that point out the obvious. Slap people who say stupid things. Slap the people who ok funding for stupid things. Slap people who say stupid things. Slap the people who ok funding for stupid things. How the irony in your post went over your head, I'm not entirely sure. Why is there a discussion at all about the phenomenon that discourse and researchers do not know about? The black hole is not a phenomenon that is seen and imagined by researchers and most of the discussion participants. The black hole is the place where matter is transformed back into the form of the substance AETHER from which matter forms. When matter forms from Aether, two important phenomena occur: gravity that gathers matter of criticality and critical mass and critical gravity (black hole), and magnetism that plays a role in forming: waves, light, heat, connection with Aether. In this measure, these researchers have found a true feature of the black hole, that is, magnetism is reduced there, only they do not know why. Here is their answer: gravity overcomes magnetism and breaks down matter into ingredients, in turn; 3 kg of particles, free gluons, 3 kg of particles lose gluon, and gluons dissolve on electrons and positrons, and these are returned to the form of Aethera. The fact that the BH magnetic field was measured is a consequence of the magnetism in BH being balanced with magnetism outside BH, since Aether also has electromagnetic properties. Apparently you did not understand what I wrote. When forming matter, quark gluon plasma is first formed, which are 3kg of the particle (3 quarks and 3 bonds of gluon) and free gluon, which occurs by annihilation of an electron-positron pair. Behind this process are formed of celestial bodies from which the chemical elements are formed up to the clusters of the galaxies. If something is not clear we can discuss this in detail, of course, if you have the knowledge and interest for that. I do not care much about the works of some "scientists" who have a high level of science, because their deposition denies the basic existence of someone who has to manage all the happenings in the universe. People who do not believe in this and can not find out anything about it! 1. To date, many high-renown scientists have produced many theory for phenomena that they did not know the origin or the way of creation and change. Today, science has no explanation as to how matter arises and from what it forms. The same applies to gravity, magnetism, energy, waves, heat and phenomena caused by their mutual relations. And in the end, they brought "final conclusions"
For example, this is about black holes, and science does not know how a black hole is produced and what its role is in the universe. You know that everything that has been formed must disappear and reappear in some other form of action, but the matter created by AETHER must return to the eye of Aether, and this place is a black hole. This is a renewable process.